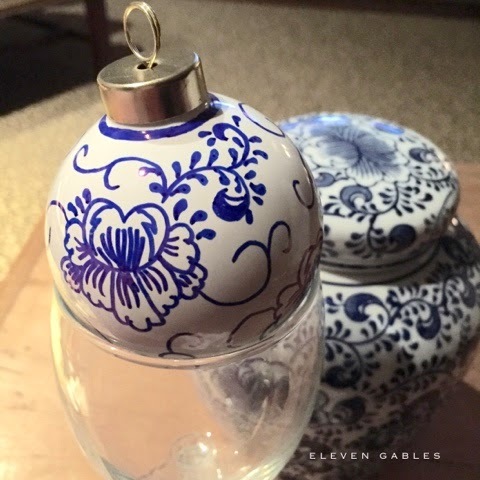 Recently, I was at a store and saw some gorgeous Chinoiserie blue and white china ornaments for sale. These have always been on my wish list to put in my blue and white kitchen. I thought there was no way I could attempt these, but for a few dollars I was willing to try my hand at painting some myself! 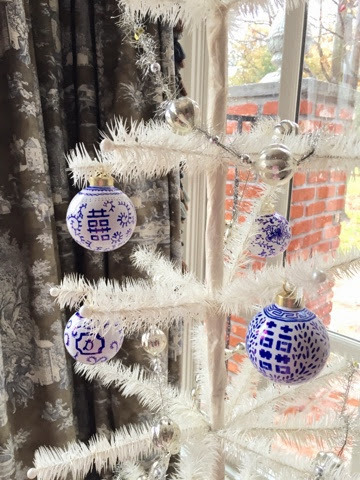 I picked up these ornaments from my local craft store, removed the ribbon, and washed the surface of the ornaments. 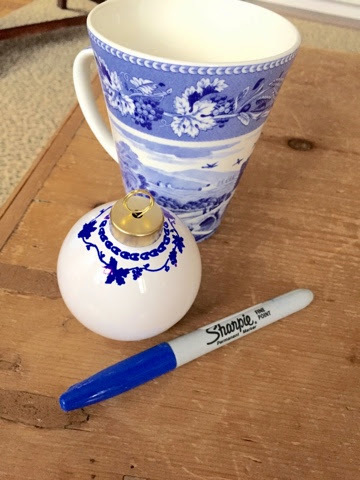 Using my coffee mug as inspiration, I start with the top of the ornament and work my way down... with a SHARPIE!!! Could you die?! 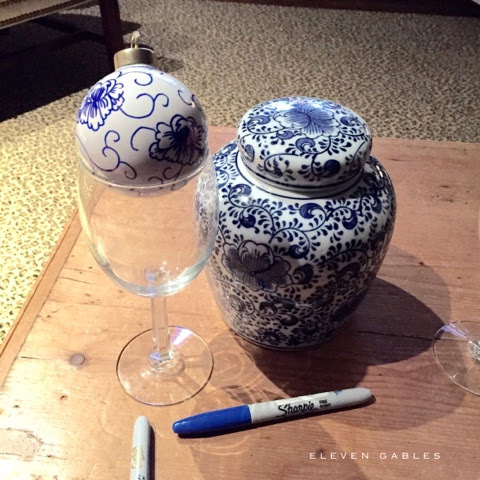 Make sure it is a brand new sharpie with a nice tip to it. This ornament was started in the car. 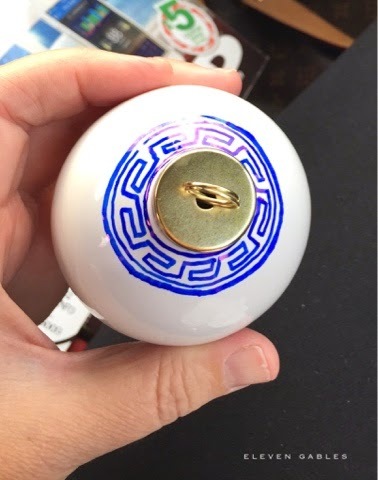 My husband was driving us on various errands and I was hooked on these ornaments, so I just did my best. If you look closely at hand painted china, you will notice slight imperfections. Those imperfections make each piece unique and special. Pretty sure I am sitting in the car here while my husband and boys run into the sports store. We settled in for an evening of ELF with the boys. I had to place the ornament in a glass to reduce shaking from all of the giggling on the sofa. 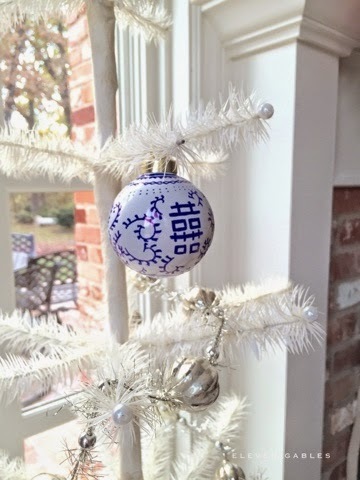 This jar is my inspiration for this ornament. Start with the basics and overall design. 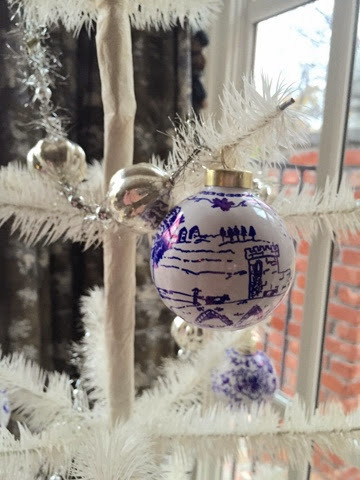 Work all the way around until you have the finished ornament. Don't be afraid to try this at home! This was my first one I made... super easy and very basic! Our home, Eleven Gables, depicted below. A custom "Lilly Pulitzer" inspired ornament for a friend. I'd love to hear that you tried this at home!!! Contact me at elevengables@gmail.com to place a custom order. What are you crafting for the holidays? Thanks for stopping by!! 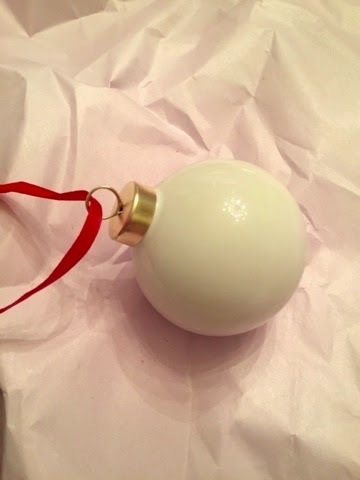 Let me know in the comments how your ornaments turned out! They look beautiful!! You are a super talented artist! HOLY MOLY i am so impressed! Love them. 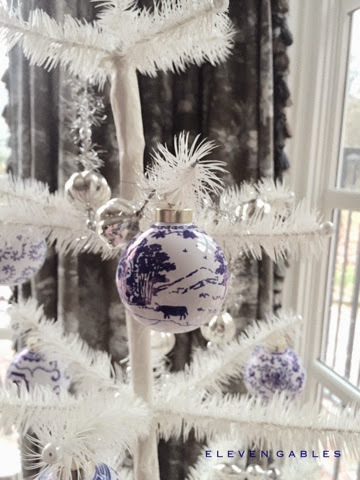 My oldest's room is blue and white and I would love to have a small table too tree for her. They are lovely. What a great idea to use a Sharpie and just go at it. Thank you, Grace! I hope you try your hand at some! Love them! What a wonderful idea. These are gorgeous, Em! The gold top makes them even better, they remind me of those blue and white pots with the brass lids. Are they from Michael's? And sold in a set or individually? 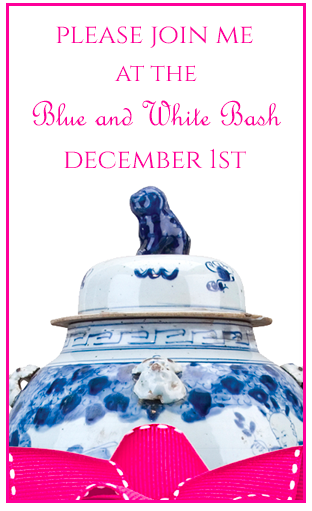 Love this so much Emily :) Blue and white for-eva! Seriously, these are just beautiful and I can see how creating them would be totally addicting! This will be a great little DIY for my girls over Christmas break! Thanks for sharing on Best of the Nest! Love this tutorial!! I linked to it in my post today. :) You are so talented!! Very impressive! I don't think I can use a sharpie as well as you did, but you made me want to try! They are beautiful! I must try this, looks amazing! Thank you, Sherry! I hope you try it! I know you will love it!! SUCH a great idea!!!! love these, thanks for sharing. 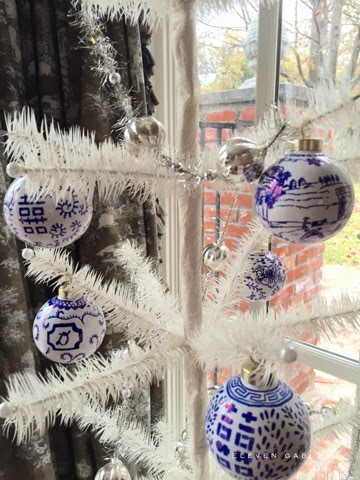 I am in LOVE, LOVE, LOVE with your ornaments. I have a newly decorated yellow living room that I have been perplexed about how to decorate for Christmas. Problem solved! 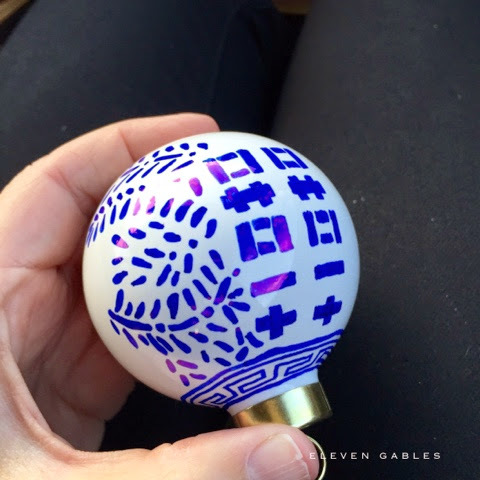 Thank you so much for sharing your method for creating these wonderful ornaments! Wooooow!!! I am so impressed!!! Beautiful! Thanks so much for sharing this fabulous idea! Gorgeous! Of course those with no talent would be very challenged to come up with ones that look half as good. That tree looks sturdy enough to hold those heavy ornaments. Where to get one! Thanks for the great ideas! I would buy these in a heartbeat! Thank you for sharing! So. Friggin. Good. Will definitely be giving these out as gifts!